Integral to Studio Manager is this single electronic repository for all people and organizations with whom you work. You can search (Find) on any word, character or number in any field such as first name, last name, company, category (e.g. vendor, client, etc. ), industry, city or postal code (zip). Finds in FileMaker are really fast. 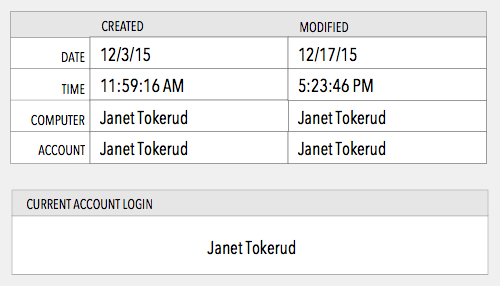 For Mac users: at the click of a button, add any Studio Manager contact to the Contacts app. 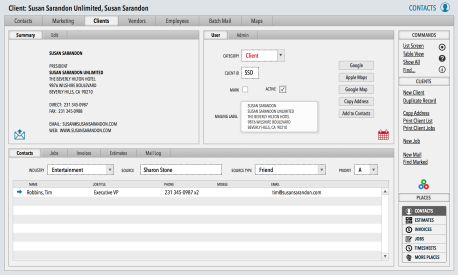 Information from Contacts is directly integrated with all the other data in Studio Manager. 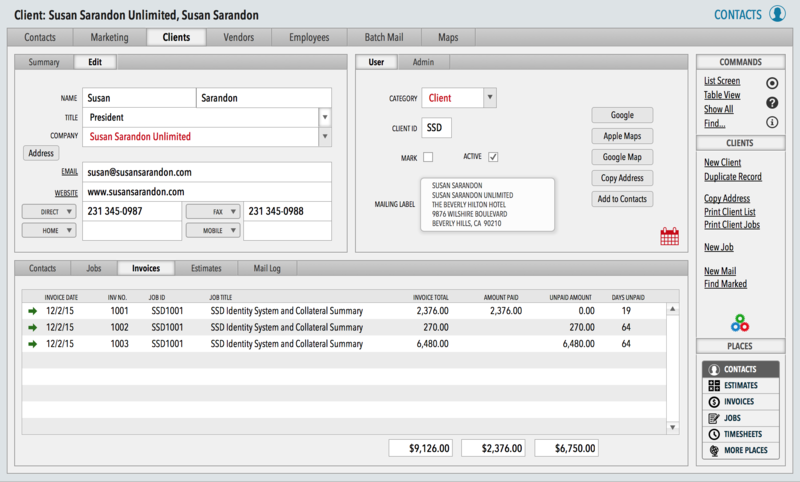 Contact data automatically feeds into your estimates, schedules, jobs, invoices and reports, letters and custom forms. Each individual contact record contains a unique Contact Number. Pop-down lists and menus throughout Studio Manager allow you to quickly and easily associate one or more contacts with a job, task, timesheet and more. Often the link happens automatically, especially when you start from Contacts. You can save sets of people and save messages with those sets of people for future use – great for marketing campaigns and holiday lists. Click the screenshots to view them at full resolution. Contacts is a control center for your entire system. For example, from the Clients tab you can view all the jobs, estimates, invoices, contacts and mail log entries related to a particular client. And with one click, go directly to that record in the corresponding module. Track what you want. You can add any number of fields to suit your particular situation. The difference between a Contacts database created in FileMaker and the Contacts app is that the database itself is customizable, and not just by adding a pre-defined field. You can easily export selected contacts to your favorite email service such as Constant Contact or MailChimp in standard formats like Excel or cvs. We can help you link up the data accumulated in those online services to Studio Manager Contacts, making that information a lot more useful to your marketing team and account execs. You can customize the reports, labels and entry screens to any typeface and add your logo where appropriate. If you know how to use a word processor or page layout program, you already know how to modify the layouts without further training. Studio Manager object styles can be changed to match in-house standards changing all standard reports in a few steps rather than layout by layout. See also, Marketing & Sales. Once you’ve seen the basics here. Stop over at our Marketing & Sales page for information on our sales and marketing capabilities under the Marketing tab.